After a stellar end to 2018 for my Bristol City with three victories including a penalty shootout win over Sunday’s opponents in the Continental Cup and then a perfect start to 2019 with a battling comeback against an in-form Manchester City team, to earn a draw. We found ourselves at Solihull Moors FC on a Sunday afternoon for a Women’s Super League encounter against a very well organised Birmingham City side. Just a few days prior it was announced that much-respected Blues manager Marc Skinner would be leaving to coach Orlando Pride in the American National Women’s Soccer League and this was to be his final game in charge. Even with our good form I felt it would be a tough test as I thought the Birmingham players would like to give there outgoing manager one last hurrah. We arrived at the neat compact stadium where a decent crowd over 600 were scattered around the ground including a splattering of Bristol City supporters. I had time to sample the delicacies of the club’s sponsors, Canadian chips, cheese curds and gravy. The pacey Rosella Ayane replaced Juliette Kemppi up front. Birmingham City were still without Ellen White despite being named in Phil Neville’s upcoming England training squad in Qatar, although she attended the game today. The game began and Bristol started much the stronger. After 16 minutes a Vixens free kick taken by Julie Biesmans found the head of Wales defender Gemma Evans and trickled into the bottom left corner of the net beating blues keeper Hannah Hampton. This was her first Bristol City goal since her move from Yeovil last summer. Emma Follis and Harriet Scott went looking for an equaliser but for the blues but the Vixens defence and goalkeeper Sophie Baggaley were equal to the challenge to end the half. Bristol went looking for more goals in the second half with a great chance for Ayane but was denied by Hampton and Carla Humphrey saw her shot go over the bar. A very lethargic Blues tried to get into the game and brought on Scottish midfielder Chloe Arthur to try and break the deadlock but Bristol’s very organised defence stood firm. The Vixens brought on the exciting young forward Katie Robinson who impressed again in her cameo. 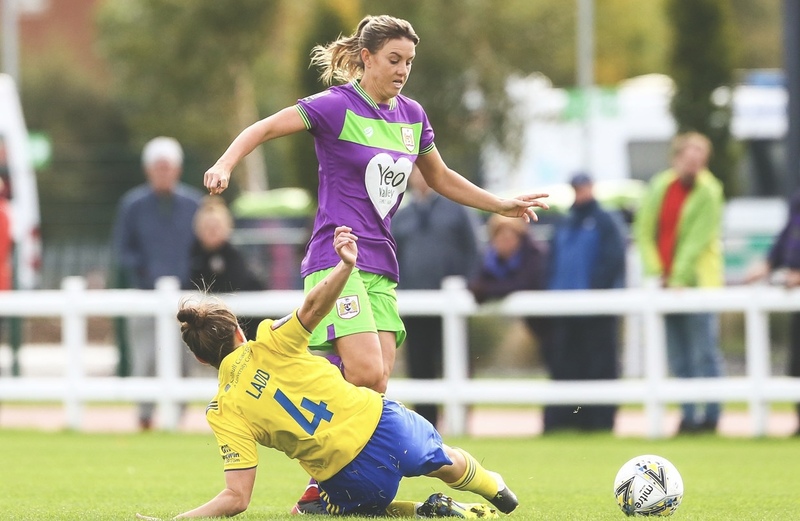 The game got a little feisty in the closing minutes as Bristol tried to keep the ball in the home team’s corner to some of the home team’s annoyance and the referee blew for a superb Vixens win. As good as Bristol City were I felt Birmingham looked tired after their epic battling Continental Cup defeat against Arsenal during the week, but nothing can be taken away from The Vixens. It was another great performance, especially in defence against a team we have struggled against in recent years. Next up for is the west country derby against Yeovil Town and despite their struggles at the foot of the table I anticipate a tough contest. I do have a slight concern, with this good form by our amazing manager Tanya Oxtoby there are murmurs that she is on Birmingham City’s shortlist to replace Marc Skinner. Fingers crossed she is happy to stay and finish what is unfinished business. 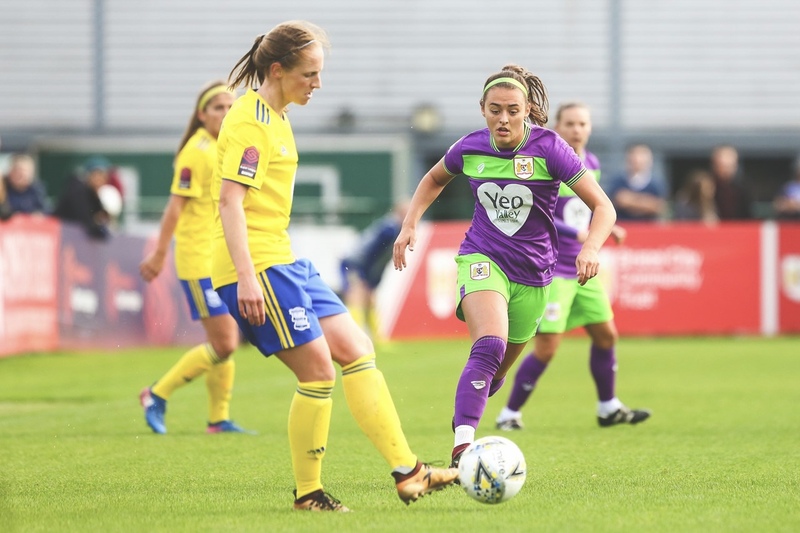 Birmingham City: Hannah Hampton, Chloe Arthur (Connie Scofield 80’), Kerys Harrop, Aoife Mannion, Meaghan Sargeant, Paige Williams, Hayley Ladd, Lucy Staniforth, Harriet Scott (Lucy Quinn 86′), Emma Follis (Sarah Mayling 77’), Charlie Wellings. Substitutes (not used): Marisa Ewers, Shania Hayles. Bristol City: Sophie Baggaley, Loren Dykes, Gemma Evans, Frankie Brown, Danique Kerdjik, Poppy Pattinson, Carla Humphrey, Ella Rutherford (Katie Robinson 84’), Lucy Graham, Rosella Ayane (Juliette Kemppi 90′), Julie Biesmans. Substitutes (not used): Eartha Cumings, Katie Rood, Heather Payne, Poppy Wilson, Jess Woolley.